Dave: The location and of course my awesome teammates. 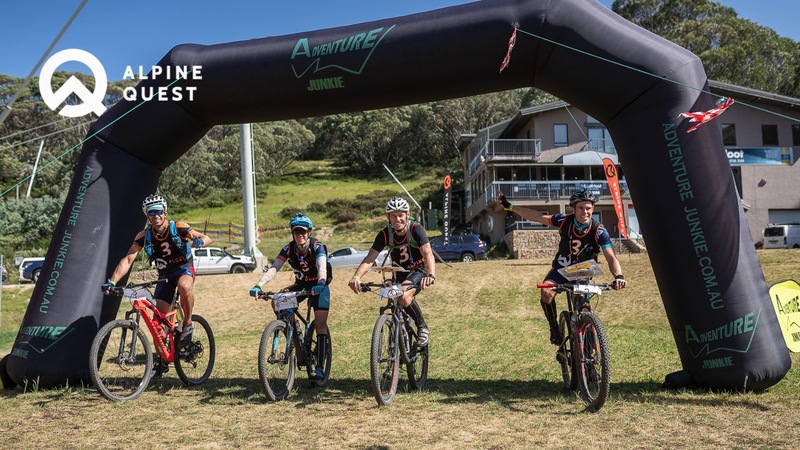 Angus: A great location at a premier Ski Resort in Victoria’s high country, the first A1 event for 2019 and the event was run by a well-oiled machine - Adventure Junkie with a new Race director in Paul Gruber. Jarad: The location, the fact that the race is in Falls Creek in the mountainous area. What if anything did you do to prepare for the high altitude and hills? Any training tips? Liz: I believe in consistency so regular practice of all the disciplines kayak, MTB and trekking /running (and joke telling). Some occasional weekend missions/adventures to go exploring really help to top up the fitness and conditioning as well as being great fun when you go with great mates. Dave: As a Queenslander, there is not much I can do to prepare for the high altitudes unless you count holding your breath whilst doing hill repeats. Training tips. Longest hill you can find and practice grinding up it on the mtb. When you have had enough of that, ditch the bike, load the pack up even more and hike to the top and run down as my times as you can (of course whilst holding your breath). Angus: In the lead up to the event at about 6 weeks prior we incorporated some more specific hiking and running with plenty of ascending and descending. Mountain Bike training in the hills is essential and we knew we had built a good base over several months to ride comfortably for 4-5 hrs. We kayak 1-2 times per week with Peak adventure which provided a good level of ladling fitness. Jarad: I live at Mt Macedon which is a little bit above sea level. However, Peak Adventure conducted a training camp the week before Alpine Quest to help athletes prepare for future AR events. This time was also very helpful for me as it allowed me to personally adjust to a little bit of altitude. As a result, I was feeling really good after spending a week at the Falls Creek prior to the race. Several of you have raced together before, but not as a team of four. You seemed to quickly work well together, was there any secret formula? Liz: I think I was the only one in the team who had raced with the others at some point, so the boys certainly knew what they were getting themselves in to. However, I think we are all relatively experienced and so came together well. We had a bit of a meeting before the race to talk strategy and goals and good communication throughout certainly helped. Dave: For me, it’s an experience. We all knew what to do and discussed our roles in the team prior. The plan was set, and we stuck with it. Don’t get upset if something goes wrong. Angus: We are all competitive and know our strengths and perhaps some weaknesses. We all get on well and can have a good laugh during training and whilst out on the race track. Our Race was about solid pace and really good communication and keeping an eye out for any early tell-tale signs that someone needs a hand before it’s all too late. Jarad: No secret formula. Although communicating teams goals before the race helped. Also not taking things too seriously. What was the most interesting or memorable leg of the race for you and why? Liz: I think the first bike leg climbing up the hill in the heat in stage 2 was definitely the crux of the race. We knew it could really blow some teams up so being conservative and racing within our limits was crucial. Trying to find the tiny bits of shade on the uphills to take a quick breather and look out for each other. How good was that little stream across the path at one point to cool down even if it didn't last long!?!? Dave: Thinking about it more, for me was the prologue and then the all-important rest. I think people pushed too hard in the prologue and that caused their demise to come the Saturday. Rest, refuel (and the right type of fuel) is the best recovery). Angus: We lost some time in the middle of the prologue so coming back through the top few teams and taking the lead in the paddle was definitely a highlight and gave us plenty of confidence going into the main race the following day. Jarad: Paddling on Mitta Mitta was great, also trekking up Big River was also a spectacular and memorable highlight. Did you feel like you had much time to enjoy your alpine surroundings or was it just about getting down to business? Liz: I felt like I found certainly take in the surroundings - especially on the long trek as it covered such varied terrain. Dave: Always take the time to look around although we couldn’t see much on Sunday, thanks to the clouds. Angus: Yes, we really enjoyed the high country and getting out to rivers, peaks remote areas that very few people ever get to. The views from the mountain tops were fantastic. Jarad: For me, the pace was quite comfortable for the majority of the race. So, we had a lot of time to soak up the scenery. No towing or suffering was involved. Favorite piece of gear you had with you during the event? Angus: Hiking poles. Took the pressure off the legs on the descents and helped keep us upright in the river ascent over the very slippery rocks. Jarad: My Brasca paddle X11 marathon is always my favorite piece of gear. We know you have all been traveling/racing/exploring since AQ. Tell us what you’ve been up to and your other racing plans for the year. Liz: I am currently in South Africa for the amazing Cape Epic MTB 8 day stage race. I am hoping this will give my MTB skills a real lift (and that I won't have to use my teammate as bait for the lions! ). Then we are planning on getting the alpine avengers back together for a superhero reunion at Geoquest. Angus: Angus is off to Expedition India on Saturday which is going to be a real adventure and cultural experience. He is joining the almighty Team Thunderbolt for this race he is sure to have a great time and hopefully a really solid race. Jarad: X-Marathon in Mallacoota is on my horizon, I’m coaching a team of new first-time expedition racing athletes. Stain Meissner, Jarrod Qin, and Angela Aldridge are keen to step up and do a full-on expedition race, so I’m helping them with it.